Although currently at risk from a range of pests and pathogens including acute oak decline, chronic oak decline, oak processionary moth and powdery mildews, a significant loss of oak is not predicted imminently. However, oak is predicted to decline in some areas of the UK in the long term. This led the project to assess other tree species for their suitability to support the biodiversity associated with oak. 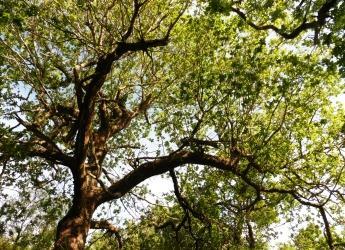 Ash trees were identified as the tree that supported the greatest number of oak-associated species. Unfortunately, ash trees in the UK are already declining due to ash dieback, caused by an introduced fungus. In total 30 other tree species were assessed for their suitability; the findings are being made available to woodland managers to help them identify other tree species that could also support oak biodiversity. The study found increasing the diversity of native tree species in our woodlands is vital to support future biodiversity.